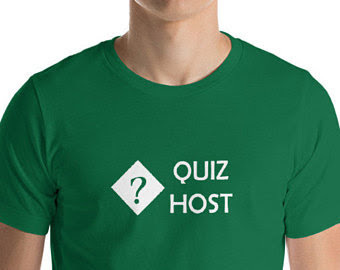 Table Quiz Helper: What is a table quiz? What is a table quiz? 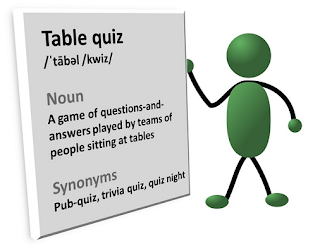 A table quiz is an event in which teams of people, usually sitting around a table, work together to answer questions. Often the questions are about trivial or general knowledge topics, so the event may be called a trivia quiz. When a table-quiz is held in a hotel, pub (ie public house), tavern, etc, then it is often called a pub-quiz. If a table-quiz is held in the evening, then it may be called a quiz night. If it is in support of a non-profit cause, then it may be called a charity quiz. Table quizzes may be purely social events, providing the main entertainment at a gathering. Or they maybe be held to raise funds or to attract people to a venue (eg a pub, church or community-centre) who don't usually go there. The teams with the highest score(s) are the winners.